The remarkable engineering skills of the Nabataeans have long been noted and admired, leading to their designation as "Masters of the Desert." An extensive system of channels, tunnels, and aqueducts carried water from Petra's springs and catchment areas to reservoirs, cisterns, agricultural plots, and public works throughout the city and its environs. 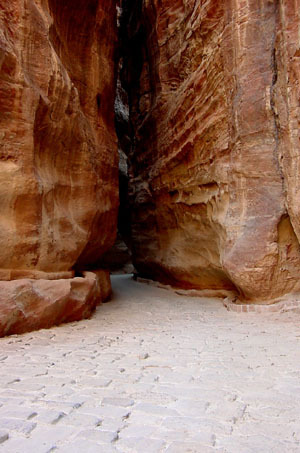 Water channels and basins carved into the rock face of the Siq, the narrow gorge that formed the entrance into Petra.